One of the tasks FTLComm is sometimes involved in, is the adventure of restoring old photographs. This amazing picture came to us with the desire by the owners for us to create a good image of the couple, but it was the car that caught our attention. If you happen to know what we are looking at, I would sure like to hear from you. You will immediately recognise that this is an expensive vehicle with what looks like 800x16 tires and those four louvers suggest a V-8 under that hood. 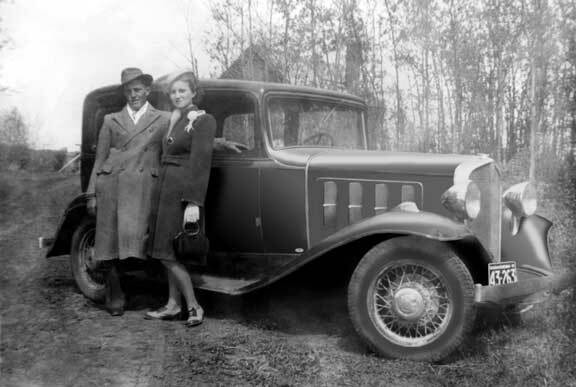 Made in the early thirties as the depression began to deepen, this two door sedan would have turned heads. So we consider some of the possibles. The first idea is that it might be a Packard, is based on the upright grill and hood louvers, but other possibilities include it being a Nash. That inexpensive bumpers and the lack of a spare on the fender suggest that it may even be a Ford "K" but those were extremely rare and unlikely to be here in Saskatchewan. So car folks, tell me what you know about this great looking machine.